Review copy provided by the publisher, thank you. From V.C. 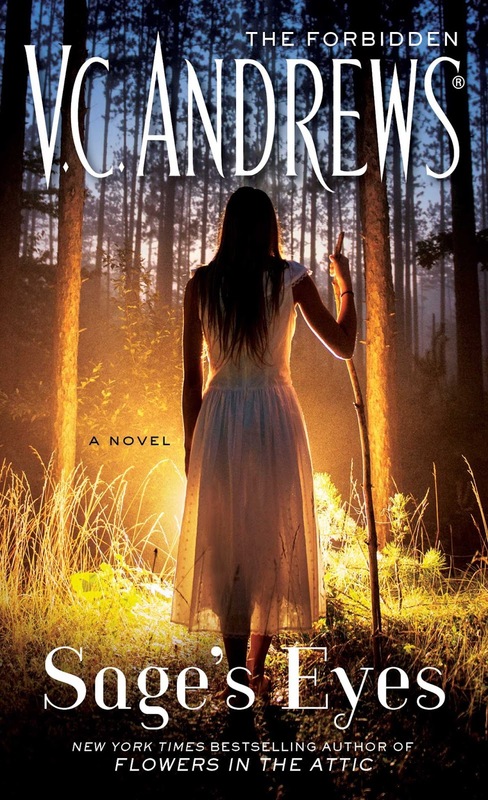 Andrews, bestselling author of Flowers in the Attic (the first in a series of Lifetime movie events about the Dollanganger family), comes the tale of a young girl kept under the watchful eye of her adoptive parents, as if they fear who—or what—she’ll become… Sixteen-year-old Sage is a lonely child. Her adoptive parents watch her obsessively, as if studying her for warning signs of…something. And maybe they’re right to—even she can’t make sense of the strange things she sees and hears. She possesses knowledge that other teenagers don’t, that her parents and teachers—no adult—could possibly have. So when Sage finally makes a friend who understands her alarming gift, he becomes her confidant, a precarious link to the truth about who she really is. For Sage and the alluring new boy at school share many things in common. Perhaps, they’ll learn, far too many things. This newest novel from the ghostwriter for the V.C. Andrews estate has a very intriguing premise. Sage is struggling to fit in high school with her friends, as she seems wise beyond her years. She is gorgeous too, and the boys want her so much that the girls envy her. Her parents treat her in an odd way, something of over-protective gone weird. They act strangely and makes Sage realize that she is different than others even where family is concerned. The bulk of the story is how Sage interacts with others as she slowly discovers new things about herself and her 'abilities'. When the new hot kid comes to town, things get interesting. Finally the ending comes and we figure out why Sage has different abilities, and why her parents have been sheltering her. While the story was intriguing enough to make me want to find out what happens to Sage, there were times that it was too over-thought. Told in a first person narrative, there was a lot of "I think.. I feel.. I wonder" and not a lot of action going on. The narratives could become cumbersome and this was my biggest complaint of the novel with the next being "really? that's it?" at the finale. As a whole, it was pretty tame, and suitable for young readers - but die hard fans of V.C. Andrews will likely be disappointed. There is not a lot of a suspense feel, just more like a small mystery waiting to be solved. The Gothic Evil Tones of vintage V.C. Andrews is missing.